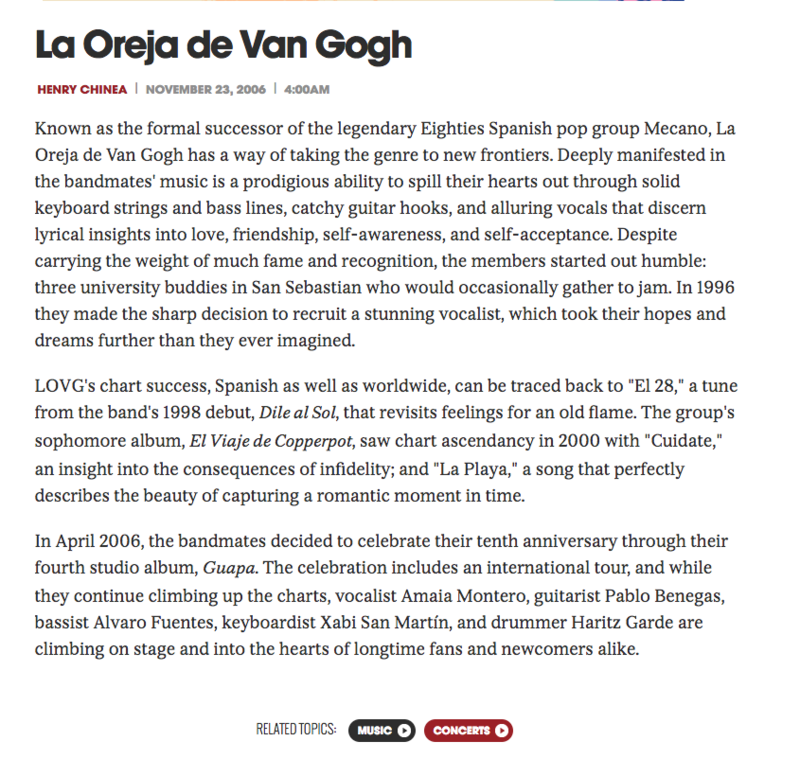 Known as the formal successor of the legendary Eighties Spanish pop group Mecano, La Oreja de Van Gogh has a way of taking the genre to new frontiers. Deeply manifested in the bandmates’ music is a prodigious ability to spill their hearts out through solid keyboard strings and bass lines, catchy guitar hooks, and alluring vocals that discern lyrical insights into love, friendship, self-awareness, and self-acceptance. Despite carrying the weight of much fame and recognition, the members started out humble: three university buddies in San Sebastian who would occasionally gather to jam. In 1996 they made the sharp decision to recruit a stunning vocalist, which took their hopes and dreams further than they ever imagined. LOVG’s chart success, Spanish as well as worldwide, can be traced back to “El 28,” a tune from the band’s 1998 debut, Dile al Sol, that revisits feelings for an old flame. The group’s sophomore album, El Viaje de Copperpot, saw chart ascendancy in 2000 with “Cuidate,” an insight into the consequences of infidelity; and “La Playa,” a song that perfectly describes the beauty of capturing a romantic moment in time. In April 2006, the bandmates decided to celebrate their tenth anniversary through their fourth studio album, Guapa. The celebration includes an international tour, and while they continue climbing up the charts, vocalist Amaia Montero, guitarist Pablo Benegas, bassist Alvaro Fuentes, keyboardist Xabi San Martín, and drummer Haritz Garde are climbing on stage and into the hearts of longtime fans and newcomers alike.